JustMop founders Kerem Kuyucu and Ali Cagatay Ozcan. From transportation to groceries, to health and beauty services and freelancer providers, on-demand startups are on the rise. In the U.S. alone, Harvard Business Review gathered from the U.S. Census Bureau’s American Community Survey that the on-demand economy is engaging more than 22.4 million consumers annually and US$57.6 billion in spending. Joining the MENA ring of this particular sector is the startup JustMop- an online marketplace for domestic cleaning services operating in Dubai, Abu Dhabi and Qatar. The startup was launched in February 2015 by Kerem Kuyucu and Ali Cagatay Ozcan, both of whom are former Rocket Internet Turkey department heads that have launched operations in different regions. Ozcan comes from streamlining fashion ventures of Rocket Internet South East Asia, having launched and expanded Foodonclick as Head of Business Intelligence and Marketing departments; he also headed operations and international expansions of SellAnyCar.com as Director of Operations. Kuyucu joined the startup life as a founding team member of Rocket Internet Turkey, moving on to start Foodonclick.com’s Qatar operations from scratch, and was then tapped to lead Carmudi’s Middle East expansion to five countries, before co-founding JustMop. And that they did- their MVP was live in December 2014, which took, as Ozcan points out, just 39 days from ideation to execution: “When we say MVP, we mean it. If you want to implement a globally proven business model in a new market, speed is the key and every day counts.” JustMop’s development stage included focus groups with potential users, individual cleaners and cleaning companies in the local market, developing a business plan, refining process flow, and designing mock-ups, followed by a soft launch of the MVP to give access to the beta platform to selected participants, giving the team a chance to refine the program. 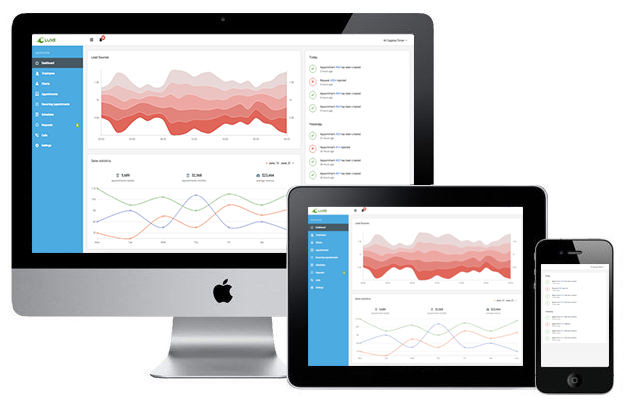 JustMop SaaS platform. Image credit: JustMop. As its business model, once a cleaning company completes a session, they pay JustMop a commission, and are additionally charged a fee for JustMop’s software. The self-funded startup recently closed a round with an undisclosed amount in December last year (although Ozcan says it’s sufficient for the next 12-18 months), led by Nevzat Aydin, the founding CEO of Yemeksepeti, joined by investors Aydin Ozol, Executive Director and Gokce Kabatepe, Managing Director, both from Raiffeisen Investment. Bertan Yeniceri, an angel investor from Turkey, was their first investor, and with the new capital, they plan to attract top talent, build proprietary tech and international growth. At the time of writing, Ozcan says the startup has made “over a million dollars in gross revenue, with more than 30,000 cleanings in less than a year,” and that their business has “grown at a rate of over 20% MoM since inception,” operating in three cities and two countries, with preparations to launch in a third country. Talking about the hurdles of growing in MENA, Kuyucu says that if there’s one thing that hinders the region’s startups, it would be attracting the right talent with limited resources. “The dilemma here is not to find the right person, but finding the right person in a timely manner within the budget you set. It is very time consuming, as it requires a thorough research and then a lot of motivational talks, vision-sharing conversations to get them on board.” Their dedication on finding the right team makes sense- though they welcome competition as it validates the market and the idea. When asked about U.S. counterparts breaking ground in the region, and local and regional competitors, the duo believes they have great differentiators to stand out. They assert that their team (whose background consists of familiar MENA startups Foodonclick, Carmudi, SellAnyCar and Microsoft HQ), along with their tech focus on having a deep learning based algorithms, and “our attitude in which we conduct businesses” of caring for their customers, sets them apart. Having launched their Abu Dhabi and Qatar operations, due diligence analysis for other potential markets and two more countries, and building their team is on the pipeline. An online payment gateway has also been released, letting customers pay through the app on iOS, Android and Window phones. The team has also partnered with Emirates Airlines, RAKBANK, Entertainer, and are "in talks" with Careem. 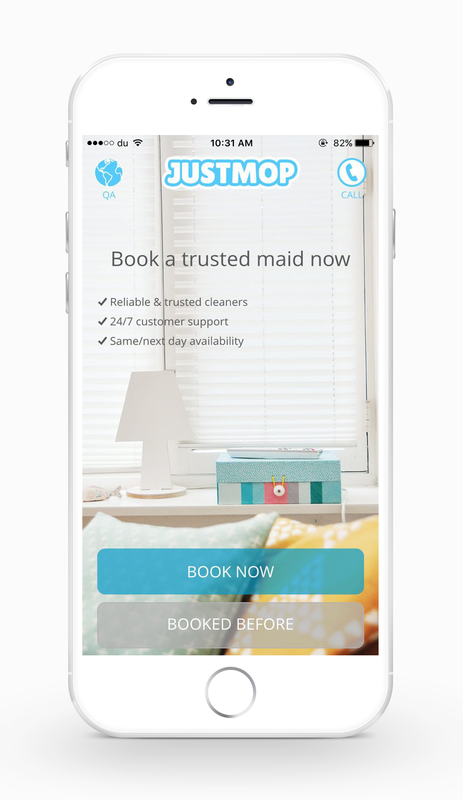 Their partnership with Instashop has enabled Justmop to be integrated to their app, so people can book cleaning services through Instashop's app. “The real deal is on our SaaS side,” says Kuyucu, speaking highly of their CTO’s background in deep-learning with a focus on artificial neural network based algorithms, as he shares some of the cool features that’s coming, which includes being able to anticipate users’ booking habits and suggest a crew member when they need a service, plus matching a first-time user with a domestic service that was highly recommended. Eventually, the startup wants to become the go-to for both users to order any home services and for home service companies to utilize JustMop’s SaaS to manage operations. JustMop App. Image credit: JustMop.